I did something last week that I had, surprisingly enough, never done before. I wrote down my goals and dreams. I have lots of goals and lots of dreams (don’t we all). I have big life dreams, career goals, goals for scrapbooking, and dreams for this blog. Many of these goals, many of these dreams have been floating around in my head for a pretty long time. I’ve been using Pages to keep a list of post ideas, to write draft posts, to keep a list of scrapbooking ideas, and for scrapbook journaling. Pages is great because it integrates seamlessly across all of my Apple devices. So I can work from wherever I am, whenever I have a free moment. Google Docs would work too. Inspired by so many of the motivational podcasts I listen to, last week I created a new document in Pages and titled it, “Big Dreams.” Something just clicked, I decided it was finally time to turn some of these goals and dreams into reality. The file sat there for a few days and every time I opened Pages I saw it sitting there blank. Then a few days ago I just wrote. I wrote down the goals and the dreams that had existed only in my head for way too long. Looking at my new list, I felt so much excitement and so much relief. Excitement to see them all written down in one place, excitement that they were now real, excitement that my goals and dreams now existed in the Universe. I felt relieved to finally have them out of my head and written down on “paper”. Now that I can see them all written down, I can actually plan out some steps on how to turn my goals and dreams into reality. So my goals and dreams are written down. What’s my next step? I have already taken some initial steps towards graduate school. I enrolled at a local community college where I’ll be taking a Statistics course this summer (the only pre-requisite I’m missing). In the fall I’ll focus on my applications and some volunteer work. My friend Ana suggested making a vision board to go along with my new list. I really like that idea but for now I’m going to let these dreams simmer. I’ve done a vision board this year for my One Little Word. Just writing these dreams down is such a big step for me. For now, I’m celebrating that. This year I’ve made some real progress with my self-confidence. I still struggle, but rather than let my negative self-talk hold me back, I will keep moving forward. Writing down my dreams means taking one more step forward. So do it! Get those goals and dreams out of your head and write them down. You don’t have to share them with the world, but share them with yourself. Bring them into existence, let the Universe be your witness. I guarantee it will feel good to see what you’re working towards. I’ve shared this quote before. I’m sharing it again because it’s been in my mind so much this year. 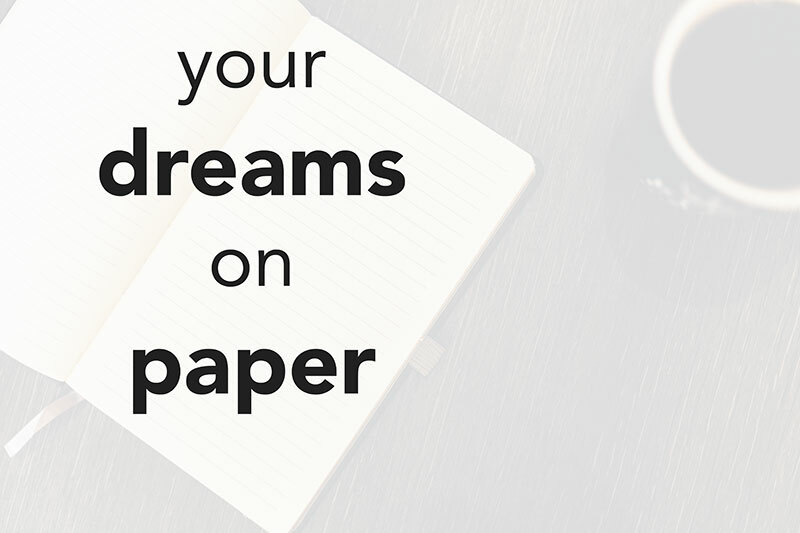 When was the last time you put your dreams to paper? 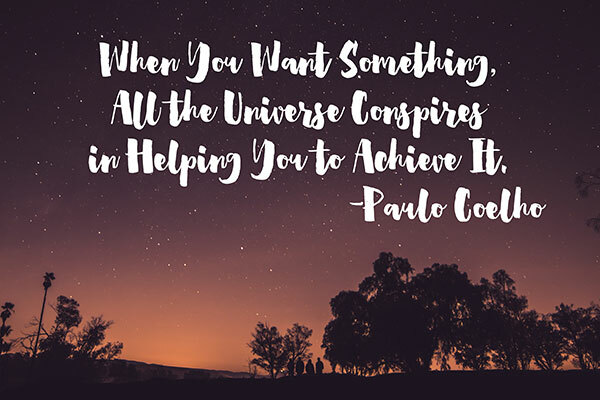 If you’re open to it, I’d love to be a witness to some of your goals and dreams. Let me know what you’re dreaming about in the comments. As always, I am grateful for you. Thank you for spending a moment with me. P.S. I’ve started using bloglovin’ as my preferred blog reader. You can follow me here. Thank you for sharing your goals and dreams, Marina. I feel that I’m always humbled when I can find a commonality between myself and others. It’s good to know that you are thinking about your goals and dreams, too. A couple sentences from your post really stood out to me: “Then a few days ago I just wrote. I wrote down the goals and the dreams that had existed only in my head for way too long.” This is the way I get my thinking/goals/dreams out a lot of times. I keep a paper journal (rather silly in such a digital world, I know), and I have these times where I just sit and write and write. It’s such a release, and it literally takes the thoughts and stores them there. You want to go to Fiji? That made me think of the movie, Aquamarine. Have you seen it? Aqua, the main character (a mermaid), has to prove that love exists before her dad forces her to marry someone she doesn’t love. She starts dating Raymond, this hot guy at their beach. Anyway, he says that he’s always wanted to go to Fiji. Toward the end of the movie, she has to go back home (to the ocean) but promises that she’ll meet him in Fiji sometime. :) It’s a cute movie. Hi Shelby! Thank you for your kind words about my goals and dreams list. I think its great that you’re already doing this in your own journal. What a great way to document how they change and/or stay the same over time. I wish I would have done it years ago. Thanks for reading!